Blog-What Happened to my Shoes? Home › About › Our Fleet Feet Blog › Blog-What Happened to my Shoes? Full disclosure: I have a shoe problem. I own more shoes than I care to admit. I have a full hall closet dedicated to my kicks, plus a few sneaker balls here and there. 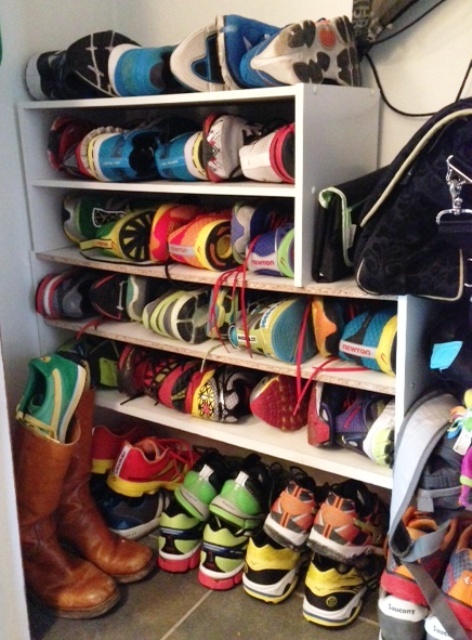 Shoes are like looking at art to me…colors, shapes, sizes, mesh, weight, overall fit, shoe strings…all of it. Working in the specialty run industry, it’s my job to know what product we sell and I take great pride in that. Although I don’t run in all of the shoes we offer, I sure know a lot about each one. If I were to ever end up on Jeopardy with the category SHOES, I’d be like Uncle Rico and take state for sure. One thing is constant in this industry…change. Have you ever found that perfect shoe for you? You know, the one that seemed like it was meant specifically for your own feet. The one that changed your life if only for a split second when you stood tall in them for the first time.You think to yourself, is this indeed a miracle? All is right with the world, right? Guess what, just when you think you have it all figured out, the shoe changes. It’s almost like a friend hurt your feelings. What did I ever do to them? I don’t remember anyone from the shoe company calling me and asking my opinion. Didn’t they know it was perfect already?Think for a second if beer changed every 12 months. It would be mass chaos. The dirty little secret about shoes is that they all change, every 12 months. Yes, even your shoe. Close to 95% of all shoes change each year. Some are small changes, while some are enormous. It might as well be another shoe. In the quest for finding the holy grail of shoes, it’s similar to an arms race to see who can make the lightest shoe, the most durable,and the most cushioned shoe in the world. Be smart, just because you’ve run in the same model shoe for years doesn’t always mean it’s going to fit the same. When you make the decision to spend your hard earned coin on a new pair of shoes, keep in mind that these changes usually make the shoe better and you may fall in love with it all over again. Aside from shoes changing every year, so do your feet. Some publications say that you exert 2x your own body weight on your feet.That’s a lot of pressure. Our feet go through a vigorous pounding everyday and taking care of them should be paramount. There, I said it, paramount. One last thing to consider is your foot strike. I’m not going to tell you what is right or wrong in that department, but you should at least be aware of it. Whether you are practicing a mid-foot strike or have a traditional heel/toe strike, the type of shoe you wear is key. After reading this blog I hope you understand that not only does every shoes change every 12 months, so does your body (feet). I urge everyone that walks in the door at Fleet Feet to go through our FIT process. Let our experience help guide you to happy feet.